Soy milk is a soy product made by combining soaked, ground, and boiled soy beans with water. Along with other soy products like tempeh and tofu, soy milk is a staple of Asian cuisine. A well-loved drink in China, Japan, and Malaysia, soy milk is now more widely and easily available in many nations across the globe. 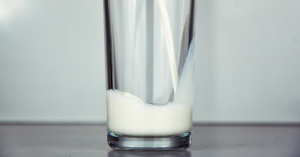 One of its most common uses is as a milk substitute as soy milk is considered a nutritious alternative to this dairy product. Soy milk is an excellent source of the plant hormone phytoestrogen. This compound serves as an effective estrogen replacement, making soy milk a good drink for postmenopausal women. Menopause causes a woman’s estrogen production to drop significantly and can bring about a number of health concerns, like a higher risk of heart disease. The phytoestrogen in soy milk alleviates the symptoms linked to the postmenopausal state by mimicking estrogen. Soy milk contains several nutrients that contribute towards improved heart health. Isoflavones are a class of phytoestrogens that work with soy milk amino acids to minimize low-density lipoprotein (LDL) or bad cholesterol. These same isoflavones have antioxidant properties too which, when combined with omega-3 and omega-6 fatty acids, can protect blood vessels from hemorrhaging and lesions. Drinking soy milk is the quickest way to use it. Soy milk can also be added to recipes that call for milk, like pancakes, macaroni and cheese, or smoothies. It should be noted that most commercial soy milks have undergone treatments that have lessened their nutritional value. Fortunately, making soy milk in one’s own home is a relatively simple process. Although more tedious than purchasing soy milk from the grocery store, this ensures that all the nutrients in soy beans remain intact and that the soy milk itself has not been tainted with additives. Soy milk phytoestrogen can diminish the chance of osteoporosis by stimulating calcium absorption and impeding the loss of bone mass. Because soy milk lacks dairy, it’s a good choice of drink for individuals who are lactose intolerant or have milk allergies. Vegans and vegetarians can drink soy milk as well since it’s derived entirely from plants. Soy milk is an excellent drink for those on low-fat diets since it has no trans fats and cholesterol and little saturated fats. Compared to regular milk, soy milk has the additional benefits of containing fewer calories and sugar. The fiber in soy milk can aid in digestion and make a person feel full for a longer period of time.